Chapter 11 of the Illinois Vehicle Code specifically states that “[e]very person riding a bicycle upon a highway shall be granted all of the rights . . . applicable to the driver of a vehicle. . . .” However, the Code also specifically excludes bicycles from the general definition of "vehicle." This legal hairsplitting by the legislature has resulted in bicyclists not fully receiving "all of the rights applicable to the driver of a vehicle." The Illinois Supreme Court analyzed this legal quandry in the case of Boub v. Township of Wayne. Boub was a cyclist who was injured when he fell off his bike as a result of a poorly maintained roadway in west suburban Wayne Township. The cyclist sued the township alleging that the defects in the roadway were such a dangerous condition that Wayne Township was negligent and responsible for his injuries. The Illinois Supreme Court rejected Boub's claim and held that Boub would only have a case if he could prove that he was both a permitted and intended user of the road. The Supreme Court held that the intended users of public roads are motor vehicles, and because a bike is not classed as a vehicle cyclists were not the intended users. Because of this rule a bicyclist cannot recover unless he also alleges additional facts that prove that the township specifically intended for him to use the road. Examples of this would be if the road was designated as a cycle route, or if there were signs stating that cycling on the road was permitted. The attorneys at Keating Law Offices believe that Boub was wrongly decided and are engaged in several cases where bicyclists were injured because of defects in the roadway. 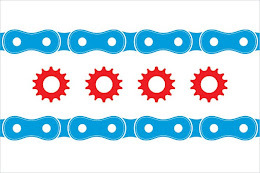 It is the firm's position that the Illinois Supreme Court should review its treatment of cyclists to reflect the changes in bike use since it decided Boub. There are multiple reasons for why this change should occur, and not just legal ones. Through programs such as “Bike to Work Week,” the installation bike racks, and the implementation a new bike rental programs, many municipalities now encourage its citizens to use bikes as a method of transport. In Boub, the court held that a plaintiff cannot recover unless he can prove that a township intended him to use the road. These modern programs provide that proof, and should serve as a presumption that bicyclists are intended users of city roads. These pro-bicycle programs clearly indicate that many townships not only intend for bicyclists to use public roads but also encourage them to do so. Therefore, it is arguably proper to hold municipalities liable if they cause injury to cyclists because they negligently maintain roads. Even when Boub was first decided in 1998, there was a vigorous dissent. The dissenting Justices claimed that the rule was “absurd and dangerous.” They were concerned that it created an unfair distinction between cars and bikes. The dissenting justices also disagreed with the majority that cars were the only intended user of city roads, and claimed that the legislature intended cars and bikes to share the road (they pointed out that the Illinois Vehicle Code specifically states that cyclists should have the same rights as motorists). Since the Boub decision, the dissent’s position has only grown more persuasive. In the 15 years since Boub was decided bicycle use has increased dramatically. Society now considers bikes as not only a leisure activity but as a valuable and serious method of transportation that provides major benefits to municipalities. In light of these benefits and the growing reliance on bikes as an important means of transport, the Court should reevaluate its decision in Boub or risk the law becoming an irrelevant anachronism. If you have any questions regarding this post please contact Attorney Mike Keating at 312-239-6787. This blog post was written with the assistance of Simon M. Baker. Mr. Baker is a third-year law student at DePaul University's College of Law where he serves as the Editor of Articles, Notes and Comments for the DePaul Law Review.